The World Judo Masters 2016, the final qualification event for the Rio 2016 Olympic Games, opened on Friday with an all-star line-up looking to build momentum for the Olympics with just 70 days to go until The Greatest Show on Earth. 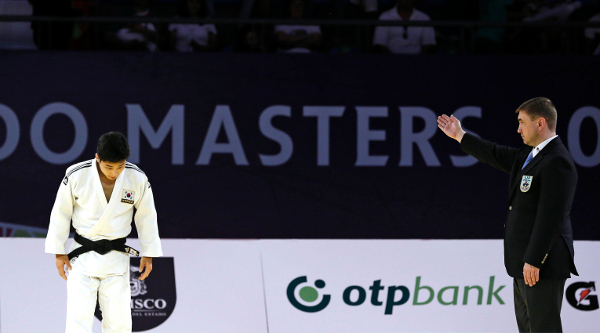 The Masters is judo’s all-star competition, a three-day day annual spectacle for the sport’s elite athletes, which is hosted in a different location every year as the marquee event in the sport after the World Championships. The top-16 ranked judoka in each category are invited to compete at the Masters and if a judoka elects to sit this one out to train at home or rest then the next fighter in line on the ranking list will be invited until the category is full. 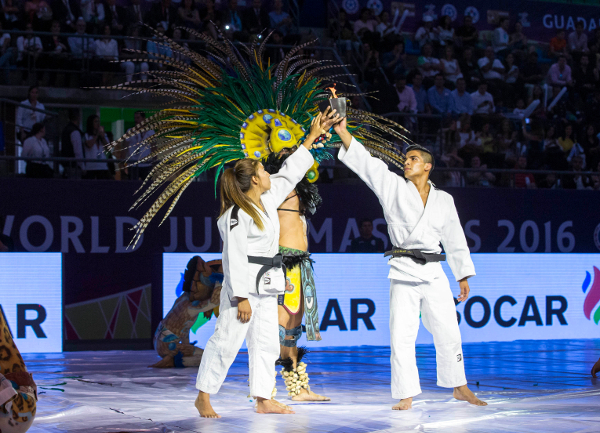 Pan America’s first World Judo Masters opened in Guadalajara with the women’s -48kg, -52kg and -57kg categories and the men’s -60kg and -66kg categories. This year’s event is the most crucial event of this entire Olympic cycle as everything hangs in the balance for a section of the field who are chasing direction qualification or a continental quota place which often comes at the expense of a teammate. At this stage of the campaign it is every judoka for themselves as far as teammates are concerned. The strongest will to win will be rewarded with a place at the Olympic Games and for a select few, the Masters and the subsequent points for a medal can offer a seeded position at the Olympics for judoka who are ranked in the top eight. The -48kg category was replete with the best of the best in the lightest weight category as Olympic champion Sarah MENEZES (BRA), world number one MUNKHBAT Urantsetseg (MGL), world champion Paula PARETO (ARG), former world champion KONDI Ami (JPN) and Olympic bronze medallist Charline VAN SNICK (BEL) were all fighting for one last opportunity to put forward their candidacy to become Olympic champion. Such is the quality of the invite-only Masters event that first round match ups were contests that could headline Grand Prix, Grand Slams and even the World Championships and the Olympics. Even the best of the best have to be at the peak of their powers from the first time they step on the tatami at the Masters or they will succumb to the talents of their well-matched peers in an event of the very highest level. Olympic and world champions faltered at the very first hurdle while other champions negotiated the most difficult of assignments in overcoming star after star to triumph when it matters the most before the Olympic Games. 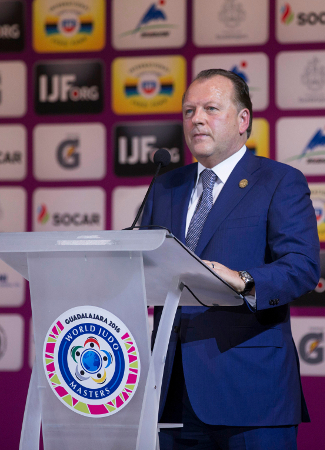 As the competition and Guadalajara was heating up, IJF President Mr. Marius VIZER took the occasion of day one of the final qualification event for Rio 2016 to speak with the media, judo fans, judoka, coaches and more in a live Twitter question and answer session. This was the second live Twitter Q&A with Mr. VIZER after the inaugural edition took place in January 2016. Stay tuned for the full transcript on the IJF website. 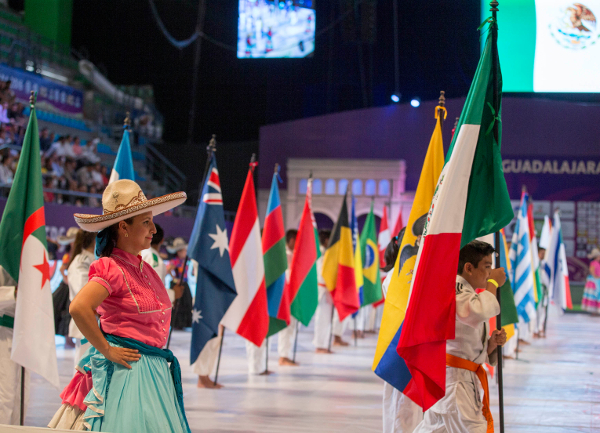 The opening ceremony took place prior to the final block on day one as the competition was officially opened in Mexico’s second largest city. 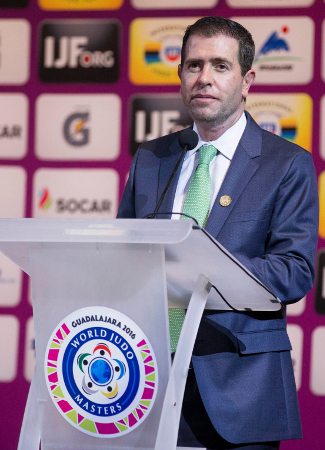 Mr. Alfredo CASTILLO CERVANTES, Minister of Sport of Mexico (above), made the opening address on behalf of the organising committee. 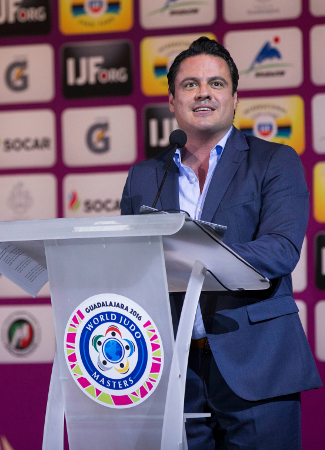 “I want to welcome you all to Guadalajara for the World Judo Masters 2016. Mexico has two women already qualified for the Olympic Games, Vanessa ZAMBOTTI and Edna CARRILLO, and there is a chance that more could qualify during this competition. 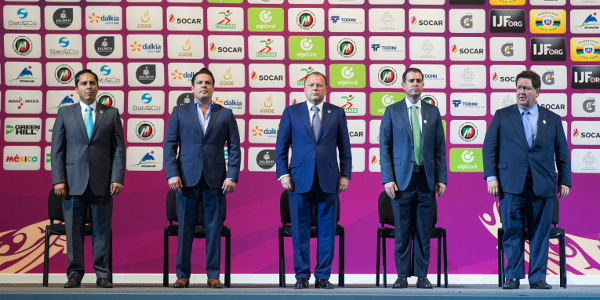 The stage was set for Mr. Marius VIZER (above), IJF President, to officially open the first World Judo Masters in Pan America. Olympic champion Sarah MENEZES (BRA) is feeling the pressure of going into a home Games as her country’s first female Olympic judo champion but is using that as a source of inspiration as she showed she is on track for Rio 2016 despite losing her final to former world champion KONDO Ami (JPN) who earned her first international medal of 2016. MENEZES, who could win her country’s first medal in any sport in Rio 2016 as she will compete on day one, was held down by KONDO who won her first World Judo Masters title at the second attempt. KONDO, 21, now has two wins from two meetings against MENEZES, and this success came from ne-waza as the young Japanese pounced on her rival to trap her in a tate-shiho-gatame hold for 20 seconds and the maximum score. Both judoka could again grace the podium in Rio 2016 and it will not come as a surprise if Brazilian MENEZES or Japan’s KONDO occupies top spot on 6 August. 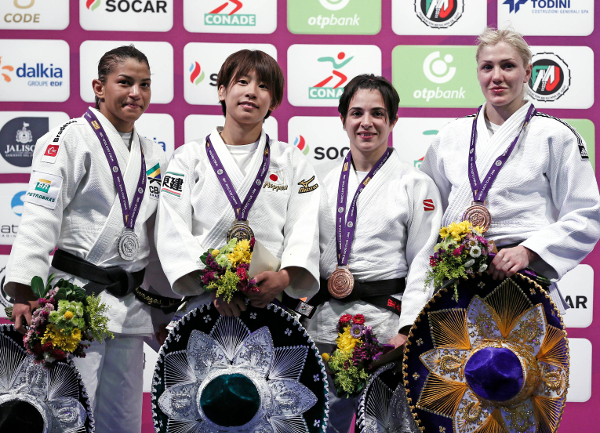 The first bronze medal contest was won by Baku Grand Slam winner Julia FIGUEROA (ESP) who fought off the challenge of European bronze medallist Dilara LOKMANHEKIM (TUR) to achieve the best result of her career. The contest between two of Europe’s best at this weight saw the left-handed Spaniard outfight the right-handed Turkish judoka and the Valencia-based FIGUEROA scored a yuko from an uchi-mata with 90 seconds left. Both judoka will move on to Rio 2016 and could be there or there abouts in the medal shake-up on the opening day at the Olympic Games. The second bronze medal was won by Almaty Grand Prix bronze medallist Maryna CHERNIAK (UKR) who defeated Almaty Grand Prix silver medallist JEONG Bo Kyeong (KOR) for a surprise result. World number 10 JEONG was sporting a new close cut hairstyle but still possessed her explosive judo as she took the lead with a waza-ari from a thunderous drop seoi-nage after 90 seconds. World number 15 CHERNIAK, whose twin sister Inna competes in visually impaired judo and is a Rio 2016 Paralympic hopeful, was far from finished as she countered a weak attack from JEONG to throw for ippon and by far the best result of her career. World champion NAKAMURA Misato (JPN) stormed towards her third Olympic Games with gold as the Japanese fighter wants to earn a gold backpatch on her judogi at her third attempt. Beijing 2008 Olympic bronze medallist NAKAMURA has won three world titles with the last coming last year to reclaim her spot as Japan’s leading performer at this weight and has looked imperious since wearing her red backpatch which is reserved for all 14 world champions. The Japanese, whose longevity is rare among the Japanese with their abundance of riches and constant flow of new talents, defeated former European champion Natalia KUZIUTINA (RUS) to win the Masters title. NAKAMURA scored a yuko with ashi-waza and followed up with a yoko-shiho-gatame hold for 20 seconds and ippon. The first bronze medal was clinched by Paris Grand Slam bronze medallist Annabelle EURANIE (FRA) as the tactically adept Frenchwoman defeated Erika MIRANDA (BRA). Veteran EURANIE, 33, who is one of the tallest, strongest, experienced and most awkward judoka in the category, has been pressed throughout this cycle for the one spot in Rio 2016 by teammate and Olympic bronze medallist Priscilla GNETO (FRA) who lost her opening contest today and appeared to suffer a knee injury. MIRANDA never imposed herself and was penalised three times in a scoreless contest as EURANIE pitched an unblemished record to equal her result from 2015 and surely settle which French fighter will receive the nod for the Olympics. The second bronze medal was won by Baku Grand Slam silver medallist Odette GIUFFRIDA (ITA) as the young Italian is now poised for a seeded slot at the Olympics having beaten top seed Andreea CHITU. GIUFFRIDA, 21, repeated her 2015 bronze medal defeated number one seed CHITU by a waza-ari as she countered an uchi-mata from the Romanian for the score with uchi-mata-sukashi. The Italian is one of the best youngsters on the circuit and now has all the momentum going into her first Olympic Games while CHITU will at least think that it’s better to fall short here than in Rio de Janeiro in August. Defending World Judo Masters champion DORJSUREN Sumiya (MGL) retained her title as she emerged from the star-studded field to overcome Samsun Grand Prix winner Helene RECEVEAUX (FRA) in the -57kg final. DORJSUREN scored first – and ultimately last – as her seoi-nage earned a yuko and RECEVEAUX lacked the conviction and energy that the occasion required as her potential Olympic place hung on the outcome of this contest as Olympic bronze medallist Automne PAVIA (FRA) was left at home. For RECEVEAUX, this contest was unlike any other in her career, it was one that could win her the backing of the French Judo Federation for the Olympics, but Masters specialist DORJSUREN was not going to be denied and will be one of the leading judoka in Rio. Olympic and world champion Matsumoto Kaori (JPN) was sensationally beaten in her opening contest by her training partner and close friend LIEN Chen-Ling (TPE) by ippon. 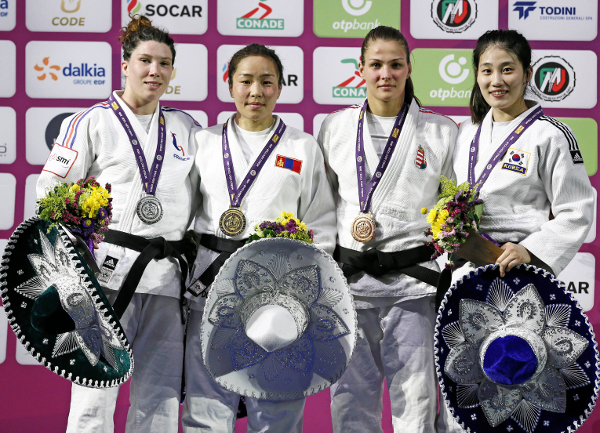 The first bronze medal was won by Tbilisi Grand Prix bronze medallist KARAKAS Hedvig (HUN) who toppled BEAUCHEMIN-PINARD by way of shido penalties. BEAUCHEMIN-PINARD was penalised twice while KARAKAS did not a receive a shido during the four minute battle and with no scores registered it was the Hungarian who found her way onto the podium. The second bronze medal was won by Asian Championships silver medallist KIM Jan-Di (KOR) as LIEN went from humbling the Olympic and world champion to crumbling in the most important fight of her career as she committed four errors to receive hansoku-make. The ninth meeting between the two left-sided fighters produced a lengthy struggle for a grip and neither judoka really came close to troubling the scoreboard. LIEN was penalised for passivity, blocking, ducking under a grip and again for passivity while KIM was penalised on three occasions and went ahead in their head-to-head series 5:4. European silver medallist Orkhan SAFAROV (AZE) stood out from the lightweight crowd of champions as he signed off from the qualification period with World Judo Masters gold. SAFAROV beat former Paris Grand Slam silver medallist Vincent LIMARE (FRA) in the -60kg final with an inspired day as one of the biggest winners in Guadalajara as he now moves into the top eight on the Olympic qualification list which offers the vital reward of a seeded position at the Olympics. Austria’s double Olympic champion Peter SEISENBACHER was in the chair for SAFAROV and the IJF Hall of Famer spurred his man on to glory as the Azeri judoka produced two yuko scores with the second coming from a speedy ouchi-gari. SAFAROV more than earned his hand shake and hug from Azerbaijan team manager SEISENBACHER who could well repeat the heroics he achieved four years ago as the mastermind of the Georgian team with his Azerbaijan aces. Former world champion TAKATO Naohisa (JPN) was upset by two-time Grand Slam bronze medallist Vincent LIMARE (FRA) in his opening contest as the Frenchman renewed his Olympic quest as he aimed to take a medal and a better result than Walide KHYAR (FRA) who had locked like a lock in for the Games after his stunning European Championships victory in April. The first bronze medal was claimed by number two seed KIM who saw off number one seed GANBAT Boldbaatar (MGL) on shidos. World number one GANBAT lost out to world number two KIM in a highly-entertaining contest despite the scoreless nature of the five minute duel. KIM was penalised for passivity before GANBAT was penalised for a false attack and then the former world champion received a second shido which provided decisive at the end of the contest. 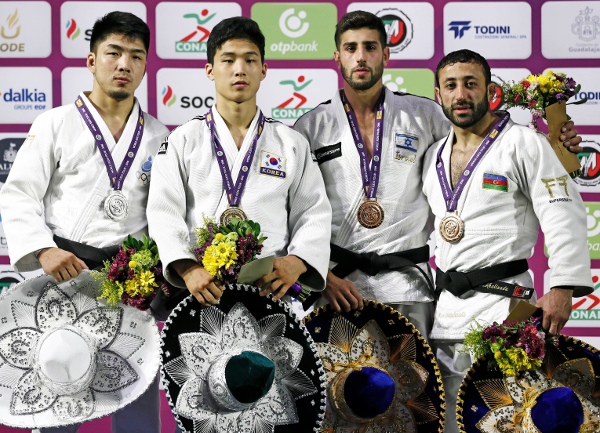 The second bronze medal went to the wily former world silver medallist DASHDAVAA Amartuvshin (MGL) instead of 20-year-old European champion KHYAR. DASHDAVAA won the first meeting between the pair by wazari-awasette-ippon as his skills were today matched by a positive attitude and he was Mongolia’s best performer from their four entrants in the lightest men’s category. World champion AN Baul (KOR) is also ready to trade his red judogi backpatch for one of the gold variety as he past his latest test with a display of South Korean brilliance. AN, 22, has a habit of making a mark on every new stage in his career, having won the World Championships at the first attempt, and now the former junior world champion has won the Masters on his debut at the invite-only event. AN will be targeting a unique hat-trick of debut victories as he approaches his first Olympic Games as one of the favourites. The Asian star was due to face 2015 World Judo Masters bronze medallist DAVAADORJ Tumurkhuleg (MGL) in the final but the Mongolian hurt his arm in his previous contest against European Games winner Kamal KHAN-MAGOMEDOV (RUS) who received hansoku-make for a waki-gatame. The first bronze medal was won by world bronze medallist Golan POLLACK (ISR) as KHAN-MAGOMEDOV could not take his place in the final block due to receiving a direct disqualification in his previous contest. The contest may not have materialised but the value of the result could not be overstated as the improving POLLACK looks set for a place in the top eight in the Olympic qualification zone. 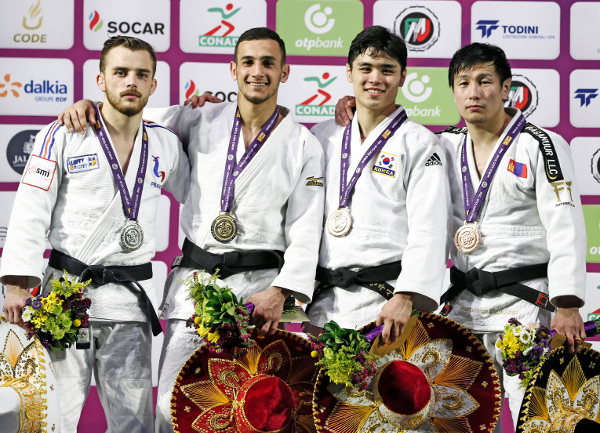 The second bronze medal went to Qingdao Grand Prix winner Nijat SHIKHALIZADA (AZE) who surpassed beaten semi-finalist OLEINIC who was off the pace. SEISENBACHER was again in the chair coaching his fighter and achieved the desired outcome as all the impetus was with SHIKHALIZADA who was bright and positive throughout with a variety of attacks including a picturesque yoko-tomoe-nage effort. Neither judoka could break the deadlock but there was still a clear winner in the Azeri who could be highly-dangerous at the Olympics this summer.